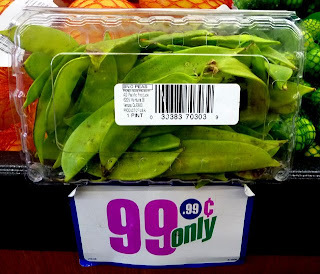 Delicate fresh snow peas on sale make a healthy stir fry. Cook them shell and all with your protein of choice. I found small 4 oz. 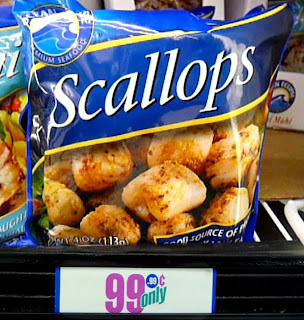 packs of frozen scallops at the Hollywood 99c only Store. I've also seen them at regular chain groceries in one dollar packs. The price of 4 oz. for one dollar equals out to four dollars per pound, not a bad deal -- plus, small portions of protein force you to eat all of your veggies! If snow peas are not available, scallops combine with any seasonal vegetable, including asparagus, string beans or leeks. 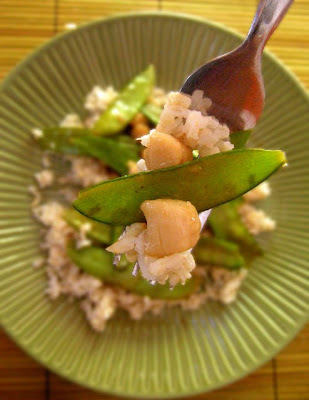 Sweet snow peas pair perfectly with delectable tender scallops. It makes for one of the quickest stir frys -- snow peas are tasty enough to eat raw and only need to be heated through; while scallops are done in just a minute (you can also substitute scallops with shrimp). 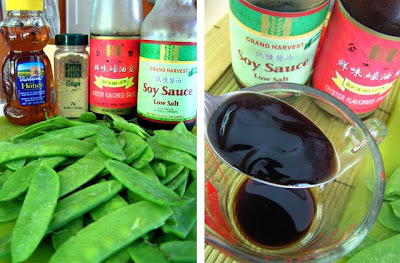 Make your own Oriental sauce by combining oyster and soy sauces with a little honey. If you have some sweet/sour sauce, use that instead. Including seafood in your entree does not need to break the bank when you stretch it by combining with your favorite seasonal vegetables. 1 pint of snow peas - about 4 cups loosely packed. O.K. to substitute and/or combine any seasonal veggies including asparagus, stringbeans, zucchini, leeks, etc. Tear off stems from snow peas if necessary; a tough string will sometimes come off with them as well. Rinse and drain scallops and add 1 tbsp. of cornstarch, or flour, to scallops - mix well in a bowl. Mix all ingredients of Oriental Stir Fry Sauce in separate bowl and set aside. Heat 1 tbsp. oil in medium/hot wok, or large pan. 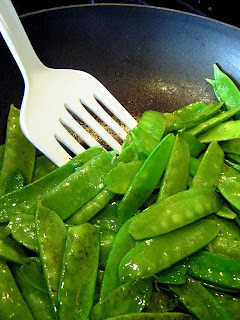 Stir fry snow peas quickly for a minute. They do not need to cook through yet. Clear middle area of wok and add 1 tbsp. of oil, then saute scallops. Stir fry for a minute until they go from semi-transparent to opaque white. Pour in Oriental Sauce and mix well. Allow to cook for a couple minutes until sauce thickens, this will finish cooking scallops and snow peas. Ready to eat; accompany rice or noodles. *Substituting asparagus or other seasonal veggies make take a longer cooking time, usually 5 minutes or so -- shrimp may take an extra minute or two; it still makes for one quick stir fry.